We have had a brilliant half term. The children have been very busy learning all about ‘Traditional Tales’. Learning about traditional tales has helped the children to understand how a story is structured. 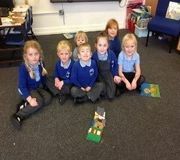 The children have had lots of fun building houses for The Three Little Pigs, exploring materials and deciding which one would make a good roof for one of the houses. They were set a challenge of collaborating to make a bed for one of the Three Bears from Goldilocks. They had to make sure that the bed was big enough so if the bear rolled over it wouldn’t fall out. The children have been working hard on their reading and writing. They have been learning to read ‘digraphs’ and ‘trigraphs’ and write sentences. They even had a go at writing the beginning of the story ‘Goldilocks and the Three Bears’. 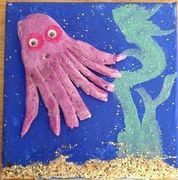 The children also created some amazing art work for our whole school art exhibition around the theme ‘Under the Sea’. They experimented with different media and created some fantastic sea creatures. In P.E. the children have been showing off their ‘cool’ and ‘confident’ moves during their BEAT dance sessions. They have thoroughly enjoyed learning moves like ‘the smurf’, ‘the prep’, ‘the soul train’ and ‘the robot’. In Maths, we have been learning all about adding. The children have explored what happens to numbers when we add and also have been playing board games, which has supported their PSED skills. They have also been learning how to measure and estimate using cubes. To end our half term, we held a ‘Fantastic Finale’ for our grown ups. The children performed their retell of ‘Goldilocks and the Three Bears’ which they had chosen their own actions for. After this the children collaborated with their grown ups to create a character mask from one of the stories we have been learning. It was a fantastic end to a great half term. The children have had another busy half term! They have thoroughly enjoyed learning the stories of Percy the Park Keeper and Owl Babies. They have been busy creating animals using natural materials, paint and other media. They retold the stories using actions and ‘Mighty Writer’. They created puppets of the characters and made up their own Percy the Park Keeper stories. The children had an amazing experience when Liberty Owls came to visit. They got to meet a variety of different owls. They discovered how they caught their prey, what different foods they ate and what the colour of their eyes meant! An owl with yellow eyes, stays awake during the daytime. In P.E. the children have been practising their balancing and travelling skills. They have learnt to use the large apparatus and demonstrated a variety of different ways to travel across, over, along and under. They have been impressing us with their counting and ordering skills and matching numbers to the correct numerals. We have explored 2D and 3D shapes. The children have been on a shape hunt, they have sorted a variety of 2D shapes in different ways and have talked about the properties of both 2D and 3D shapes. The children have again been working so hard this half term and to end it they are busy learning the songs for our Christmas Performance; ‘The Sleepy Shepherd’. We have had a brilliant first half term! We are all very proud of how the children in Reception have settled in to school and it is a joy to share their excitement at being with their friends and making new discoveries. They have quickly become able to independently organise their own belongings and make a smooth transition from coming to school to 'Let's Choose' where each child can explore and develop their own ideas through the use of resources in their own class, the conservatory, the outside area, or Buttercup Base. We have had a very busy and fun first half term. The children have been taught the Golden Rules and the core values of 'Respecting, Collaborating and Aspiring'. Through the theme 'All about Me' the children talked about themselves and recognised that although there will be many similarities between themselves and others, that there will also be differences and that we treat everyone with respect. We looked at different types of families and homes. The children looked in a mirror to help them to paint a 'paper plate' face and used wool for hair. They also had the opportunity to find out about our favourite foods, toys and games through a range of games linked to our PSED 'Jigsaw' lessons. The children have practised writing their name and making marks for meaning. We have also followed the Write Dance programme to help further develop a range of mark making movements. We love scrimbling! The children have had the opportunity to use scissors and develop fine motor skills through threading and other activities. In PE the children have been using a range of large apparatus to practise their throwing, balancing and jumping skills. The children are being encouraged to further develop their listening, speaking and understanding skills through all areas of the curriculum. Through 'Picture of the Week' they are given the opportunity to build on their own ideas of what they can see to use extended sentences which incorporate descriptive vocabulary. Children have thoroughly enjoyed the theme ‘Supertato’. We loved their superhero costumes for our dressing up day! The children loved solving various shape space and measure problems for Supertato, including measuring the ‘Veggies’. We have had the opportunity to discuss story events and represent their own ideas through art work, drama, and play. The children have enjoyed singing a range of number rhymes and have used practical apparatus, for example Numicon, to develop their counting skills. They have also used the ICT Program 'Number Run' to consolidate early number recognition skills. The children have also had experience of playing a range of games, for example Number Bingo. The children used 2D shapes to create pictures of superheros.